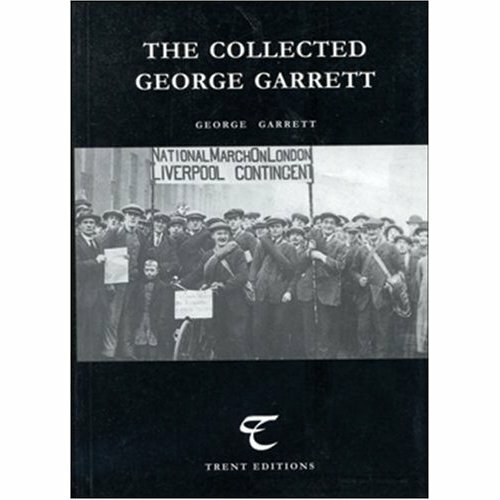 George Garrett’s name weaves through the history of working class activism in the 1920s and beyond. As well as being a prominent organiser and totally determined fighter for what he believed in, he was an extremely gifted writer. His short stories are wonderfully formed and on a par with anything that may be considered to show ‘literary’ genius; he also wrote plays and was a well-read and more than competent literary critic. This is the more remarkable considering the conditions he was working under, the lack of formal education, his total commitment to and involvement with political actions, and the grinding poverty and injustice all around him. He was also an extremely gifted chronicler of events. His Liverpool 1921-1922 gives intensely human insight to what was happening at a time when unemployment in Liverpool had topped 60,000. The Workhouses was turning away the starving from their doors. Ex-servicemen who had been heroes a while before were selling their medals to survive. We’ll be looking at his stories from The Collected George Garrett edited by the late Michael Murphy (whose premature death deprived us of bringing back to attention yet more of those parts of the city’s history so often forgotten or glossed over). Nerve Magazine from Catalyst Media, Autumn 2006, has an excellent and concise overview of Garrett’s life and significance by Francis Boyce. So important is his place in history and Liverpool literature that we shall be giving several posts to discussing these. Born in 1896 in Secombe where his father had a confectionary business, after hard times fell the family moved to Park Lane where his father became a stevedore. In a city riven with sectarian anger, Garret’s father who was a Loyal Orange Lodge member and his mother who was of Irish Catholic stock, the boy became sickened by the ongoing antagonisms. At school he witnessed the desperate poverty of many children wearing deceased grandparents’ hand-me-downs, and the disgusting humiliation, violent assaults and general bullying handded out by priests and teachers. His short story Apostate is a semi-autobiographical tale of such religious abuse. Fellow workers, it is all very well criticising the alien as one of your speakers has been doing, and telling you that he is the cause of your unemployment. It is not so. The present rotten system is the cause… All workers are slaves to the capitalists no matter what their race, colour or creed is, and there is more slavery under British Imperialism and the Union Jack than under any other flag. You Britishers, you sometimes give me a pain. I don’t tell people I’m a Britisher. I had no choice in being where I was where I was born. How many of you have the guts of the Indians who are following Ghandi in India today, or following Michael Collins in Ireland? There people are only trying what we should be doing, breaking the bonds of their serfdom. Such a speech would have been as radical then as, for some, it would still be today. A high-wire netting divided the workhouse grounds into sections. Through this, wives conversed with husbands, and children with their fathers. Some of the marchers stared in amazement as little tots pressed their lips to the wire in awkward kisses for their fathers, stooped low on the opposite side of the wiring. After the march, as one of the organisers Garrett was blacklisted. He went back to the United States where he wrote plays, returning to Liverpool in 1926 as the General Strike was petering out. In the next five years he worked nine months as a casual docker. During the next five years he only found two weeks’ work. I was very greatly impressed by Garrett. Had I known before that it is he who writes under the pseudonym of Matt Low in the Adelphi and one or two other places, I would have taken steps to meet him earlier. He is a biggish hefty chap of about 36, Liverpool-Irish, brought up a Catholic but now a Communist. He says he has had about nine month’s work in (I think) the last 6 years. He went to sea as a lad and was at sea about 10 years, then worked as a docker. During the war he was torpedoed on a ship that sank in 7 minutes, but they had expected to be torpedoed and had got their boats ready, and were all saved except the wireless conductor, who refused to leave his post until he had got an answer. He also worked in an illicit brewery in Chicago during prohibition, saw various hold-ups, saw Battling Siki immediately after he had been shot in a street brawl, etc. etc. All this however interests him much less than Communist politics. I urged him to write his autobiography, but, as usual, living in about two rooms on the dole with a wife (who, I gather, objects to his writing) and a number of kids, he finds it impossible to settle to any long work and can only do short stories. Apart from the enormous unemployment in Liverpool it is almost impossible for him to get work because he is blacklisted everywhere as a Communist.